Home Uncommon talks on common candidate! Uncommon talks on common candidate! Several events that will have significant implications on how Sri Lanka’s political landscape will take shape occurred last week, highlighting the underlying tensions in the build up to the presidential election later this year. The first of these took place last Friday, when the third and final reading of the government’s budget was put to the vote in Parliament. It was passed comfortably with a majority of 45 votes with 119 members voting in favour and 74 against. The ruling United National Front (UNF), the Tamil National Alliance (TNA) and the Ceylon Workers’ Congress (CWC) voted for the third reading of the Budget to be approved while the Joint Opposition (JO) and the Janatha Vimukthi Peramuna (JVP) voted against. What was most interesting about the vote was that parliamentarians from the Sri Lanka Freedom Party (SLFP) who are not members of the JO abstained from voting. This was despite a public statement from Chairman of the Sri Lanka Podujana Peramuna (SLPP), G. L. Peiris, that the SLFP should first establish its bona fides in its talks with the SLPP by voting against the budget. The talks between the two parties are a move aimed at unifying the opposition against the UNF at the forthcoming presidential and general elections. More importantly for President Maithripala Sirisena, they are being held with the objective of promoting him as a common presidential candidate. Now that the SLFP has abstained from voting against the Budget, apparently after discussions with the President and on his direction, it appears to have effectively ended whatever chances it had of teaming up with the SLPP for the presidential election. This then raises the question as to whether the President would contest the election at all. It will be recalled that during the 2015 Presidential election campaign, he pledged to be a one-term President. President Sirisena repeated his promise even after he was elected to office. That was based on the premise that the Executive Presidency would be abolished. That has not eventuated. It was clear from recent political developments that the President Sirisena entertained the prospects of a second term. His attempts to appoint Mahinda Rajapaksa as his Prime Minister in October last year were seen by many as an attempt to win over the SLPP. Had that move succeeded, the SLPP would have been in office now with Mahinda Rajapaksa as Prime Minister. The party would then have been obliged to accede to President Sirisena’s request to run for President as their ‘common’ candidate. However, with the Supreme Court ruling that the dissolution of Parliament was unconstitutional, those plans went awry. The question now is whether President Sirisena, without the support of the SLPP, wants to go it alone. If his chances of success are a consideration, then the prospects are not inviting because when his faction of the SLFP contested against the SLPP and the United National Party (UNP) at the 2018 Local Government elections, it finished a poor third with only thirteen per cent of the vote. However, President Sirisena’s loyalists feel differently. They say that he can take his case to the people, arguing that he has acted against corruption on both sides of the political divide. His current crusade against drug trafficking will also stand him in good stead, they believe. Another major aspect of the President’s strategy came to light on Tuesday. That was when Dayasiri Jayasekera, who is General Secretary of the SLFP, revealed that the President was considering seeking a clarification from the Supreme Court as to when his term of office began. It will be recalled that previously, in early 2018, the President sought a clarification from the Supreme Court. That was to determine whether the duration of his term of office was six years or five years. The confusion arose because the duration had been reduced from six years to five years by the 19th Amendment to the Constitution. The clarification was to determine whether the change applied to President Sirisena because the 19th Amendment was enacted after he was elected to office. On that occasion, the Supreme Court, in a unanimous verdict from a five-judge bench that comprised of then Chief Justice Priyasath Dep and Justices Eva Wanasundera, Buvaneka Aluvihare, Sisira de Abrew and K.T. Chitrasiri determined that the tenure applicable to President Sirisena was also five years. Interestingly, both then Chief Justice Priyasath Dep and Justice Eva Wanasundera have retired now. On that occasion, Attorney General Jayantha Jayasuriya who appeared for the President argued that President Sirisena was elected on January 8, 2015 for a period of six years and that any change of his term would be ‘an alienation of the sovereignty of the people’. Tuesday’s arguments by Dayasiri Jayasekara raise the prospect of a delayed presidential election. Jayasekara pointed out that the 19th Amendment to the Constitution was signed into law by Speaker Karu Jayasuriya on June 21, 2015. He suggests that this was when it became effective. Jayasekara, himself a lawyer by profession, argues that President Sirisena’s five-year term should be counted from that day. This means that the President Sirisena could potentially remain as President until June 20, 2020. “This is why the SLFP is likely to seek a Supreme Court ruling on this highly sensitive issue and right now we are consulting our lawyers. 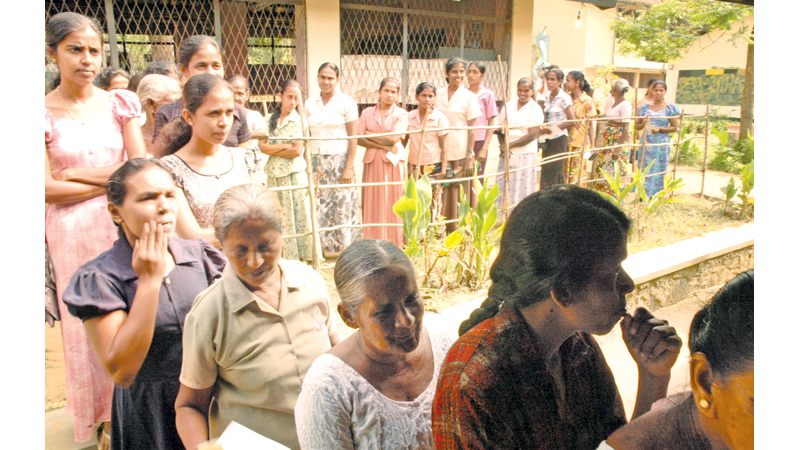 Another school of thought is that the 19th Amendment does not have any retrospective effect,” Jayasekara explained. Jayasekara’s latter argument however does not appear very robust as the Supreme Court, in its determination in 2018 declared that the five-year term of office applied to President Sirisena. In effect, this meant that the 19th Amendment applied to him retrospectively. Jayasekara also stated that the President was keen to dissolve Parliament at the earliest possible date which is four and a half years after its first meeting- which will be on February 28 next year. However, this is contingent on whether President Sirisena will be in office at the time because, as matters stand now, the presidential elections have to be held before that. While all this was playing out in the corridors of power in Sri Lanka, a different drama with major implications for the country was being reportedly enacted in California, in the United States. It was reported that summons was served on former Defence Secretary Gotabaya Rajapaksa on two different civil cases. It was reported that one case has been filed by Ahimsa Wickrematunga, daughter of slain editor of The Sunday Leader Lasantha Wickrematunga alleging that Rajapaksa had a role to play in that assassination. It has also been reported that the other case has been filed by an organisation known as the International Truth and Justice Project (ITJP) on behalf an individual identified as Roy Samathanam, who claims to be a victim of torture in Sri Lanka when Rajapaksa was Defence Secretary. “Notice was formally served on Mr. Rajapaksa on Sunday night at a Trader Joe’s parking lot in Pasadena. Notice was also served at the same time in a separate case filed by another organisation on behalf of assassinated journalist Lasantha Wickrematunga,” the ITJP said in a media release that followed. Interestingly, commenting on the incident was Yasmin Sooka who is the Executive Director of the ITJP. It will be recalled that Sooka was on the “Panel of Experts” appointed by then United Nations Secretary General Ban Ki Moon to inquire into alleged war crimes in Sri Lanka during the Eelam war. Sooka was extremely biased against the actions of the Sri Lankan Armed Forces during the war. Reports that summons had been served on Rajapaksa- including a photograph of the alleged event- circulated widely on social media. However, Rajapaksa’s nephew, parliamentarian Namal Rajapaksa took to social media to deny such an incident. “Not sure if I’m appalled or amused by the lengths some people will go to publicise unsubstantiated claims based on strategic propaganda,” Rajapaksa said on his Twitter account. A spokesman for Gotabaya Rajapaksa also denied that summons had been served. Nevertheless, these reports add a different dimension to the presidential race. They again raise the prospect that Gotabaya Rajapaksa, currently the most visible among potential candidates, may be debarred from contesting at the presidential elections. That could possibly result in two possible outcomes. The SLPP could stick to its guns and go ahead with its own candidate which it must then identify. Alternatively, it creates a window of opportunity for President Maithripala Sirisena to become a ‘common’ candidate again. Politics may take a backseat in the coming week because of the upcoming New Year festivities but it will return to the headlines soon after, as Sri Lanka’s major political parties struggle to choose their nominees for its eighth presidential election.